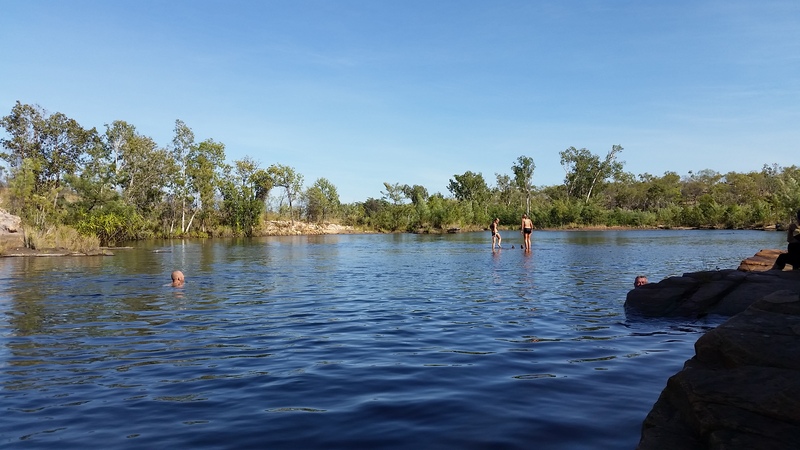 After we left Keep River NP, we decided to continue driving all the way to Katherine as we needed to refill the fridge and the gas bottles. 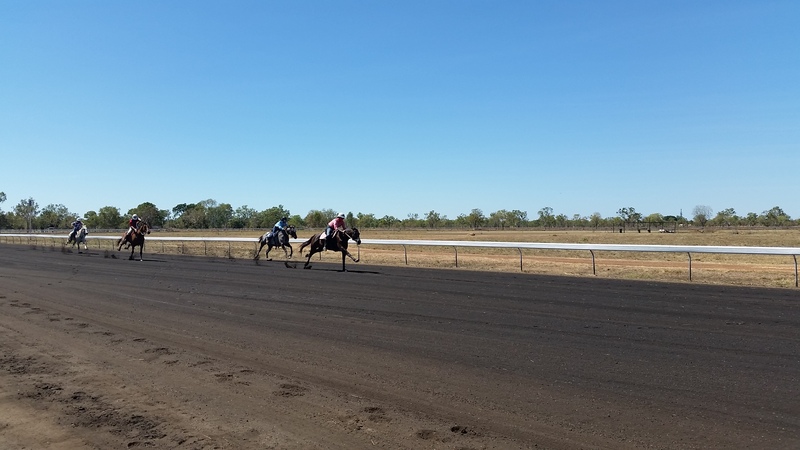 We stopped in at Victoria River Roadhouse for lunch and arrived in Katherine about mid-afternoon, setting up camp at the Big 4. Immediately we weren’t impressed with the Big 4, the staff were rude and obnoxious and the site they gave us was very small and stuck between 2 big trees. 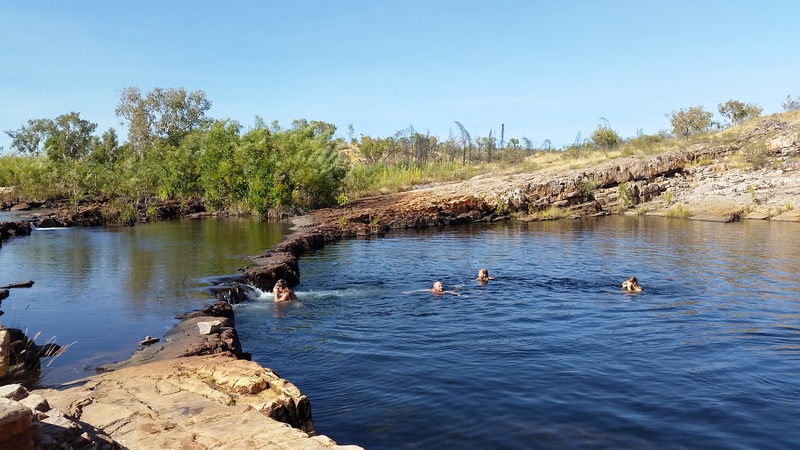 As we had paid for 2 nights, we waited out our stay and then packed up and headed to Riverview Caravan Park just up the road, with much nicer staff, bigger sites and only being a stone’s throw from the hot springs. 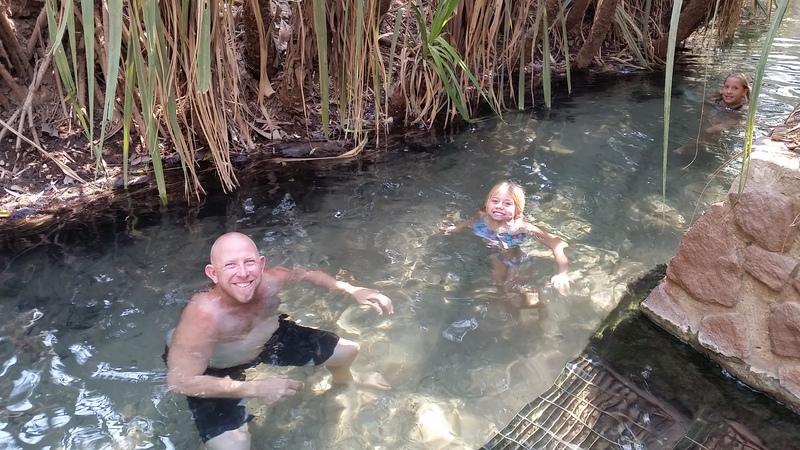 Nik, Abs and Jess enjoying the hot springs. Big turn out by the locals. 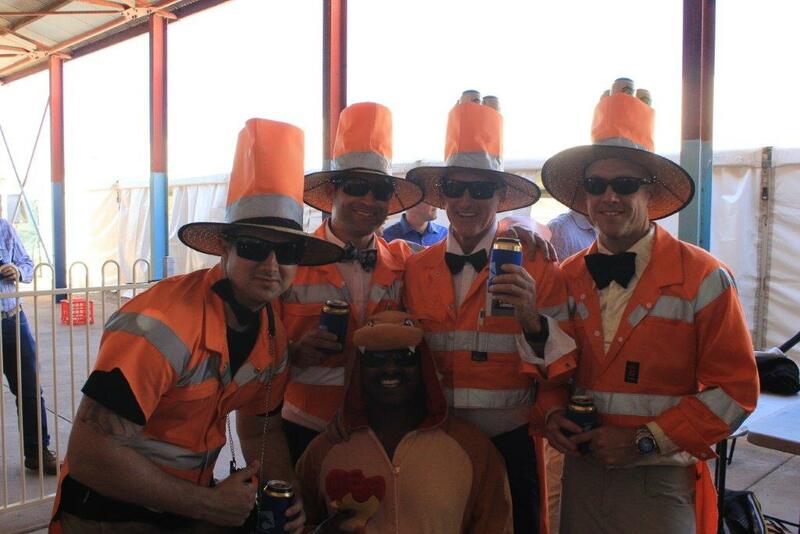 Dressed up to the nines!!! 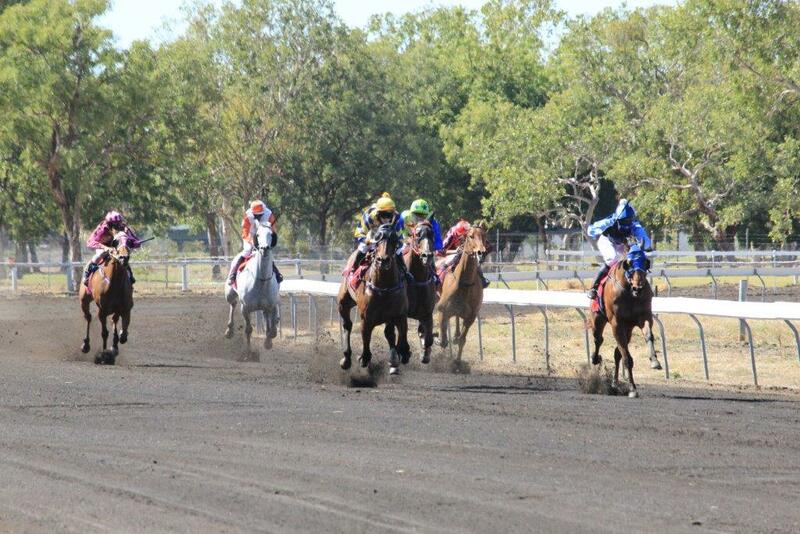 The running of the Katherine Cup. On our last day in Katherine we decided to head out to Katherine Gorge just out of town. 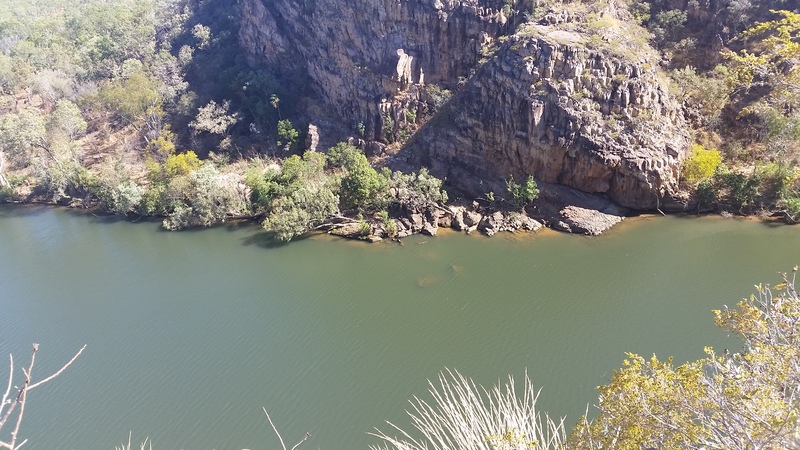 Unfortunately, as we were late getting going we didn’t get to attempt the long hike to Butterfly Gorge, only doing the short 4 ½ km walk to the lookout and back. Still the views were lovely and we got to see a crocodile from above. 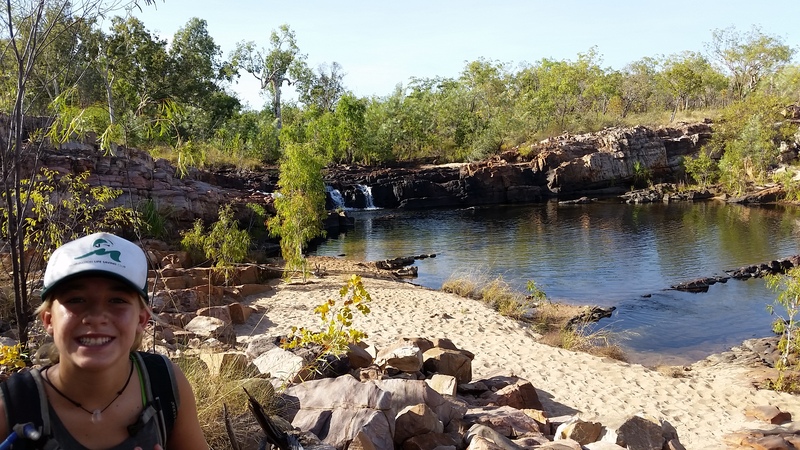 When we were in the visitor’s centre at the gorge we were in line behind a trio of women who were just about to start the Jatbula walk, a 5 day/ 60km hike up to Edith Falls, it sounded awesome and gave Bec, Nik and I some inspiration for future adventures. The rest of the day was spent touring around town finding Geocaches. 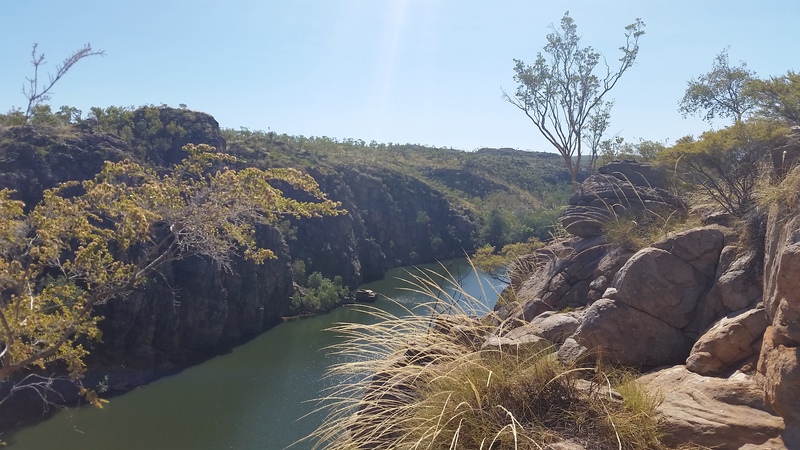 Katherine Gorge from the lookout. 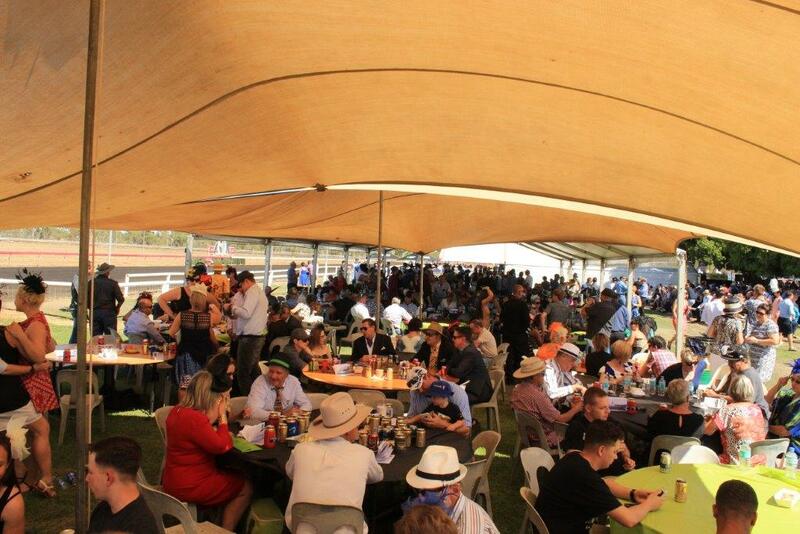 Can you spot the croc…. 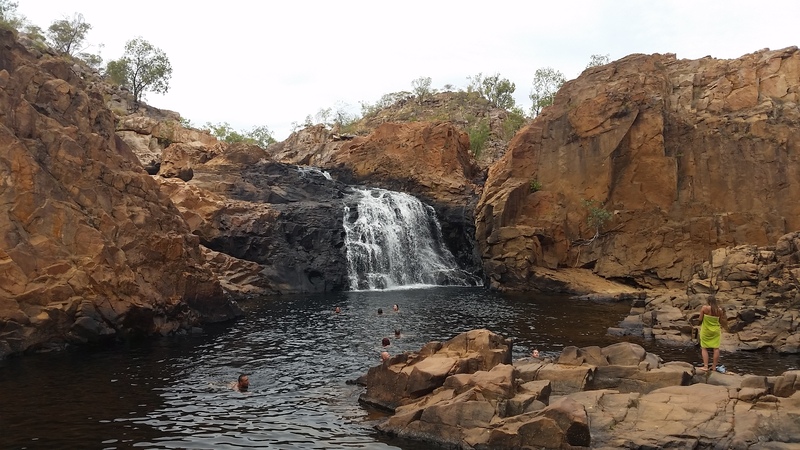 After our time in Katherine was up, we decided to go to Edith Falls, which is located about 70km north west of Katherine. 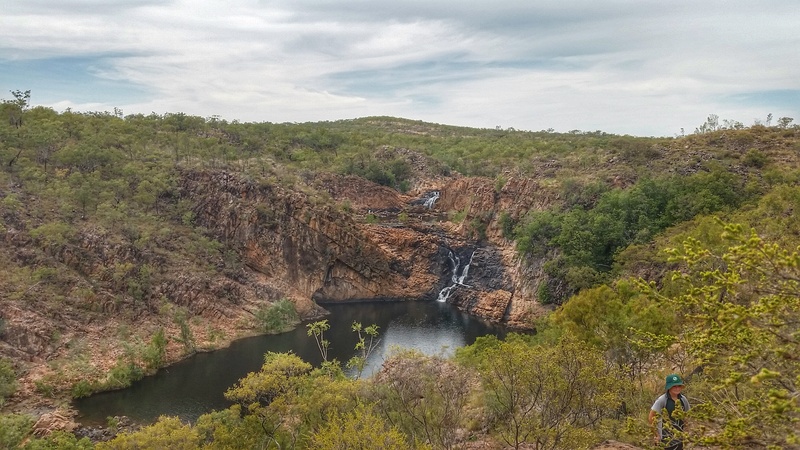 Edith Falls is part of the Nitmiluk National Park which stretches down towards Katherine, encompassing Katherine Gorge. 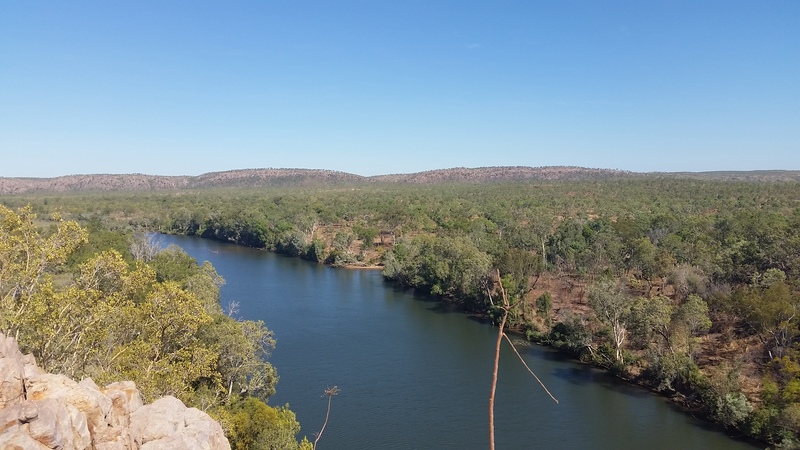 The word on the travelling street was that you needed to get there early in order to secure a campsite as they fill up fast, so with that in mind we rose early, packed up and were waiting in about 10th in line at the Edith Falls kiosk at 8:30am ready to book in for 2 nights. Luckily we scored a decent sized campsite, it was lovely with a shaded grassy area behind where we set up our table and chairs. 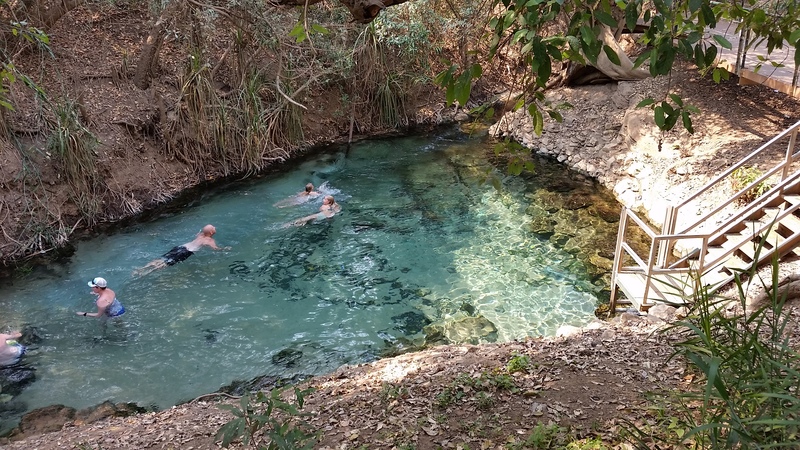 That afternoon we did the short 2.8km Upper Pools hike, it was a nice waterfall and swimming area, but we were not wowed, perhaps in part to the crowd that was there, plus the water was a little chilly. 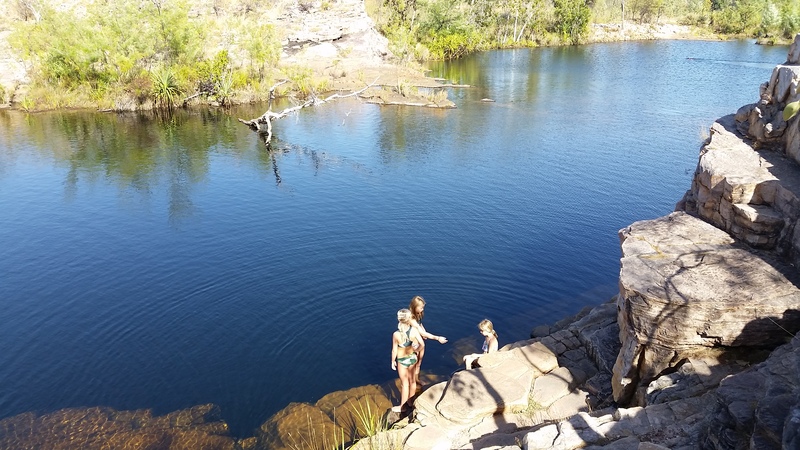 We finished off the day by swimming down at the plunge pool, the size of a large dam, which was only 500m from our van. Views of the upper pools from the hike in. 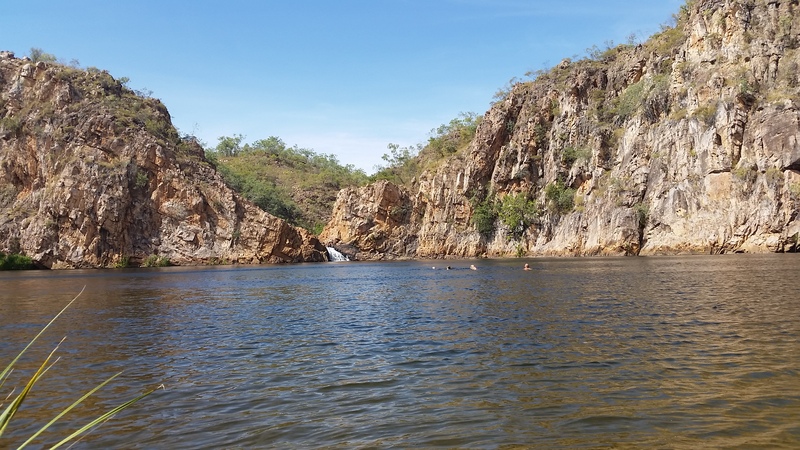 Swimming at the upper pools at Edith Falls. Scrambling over the rocks for a swim. 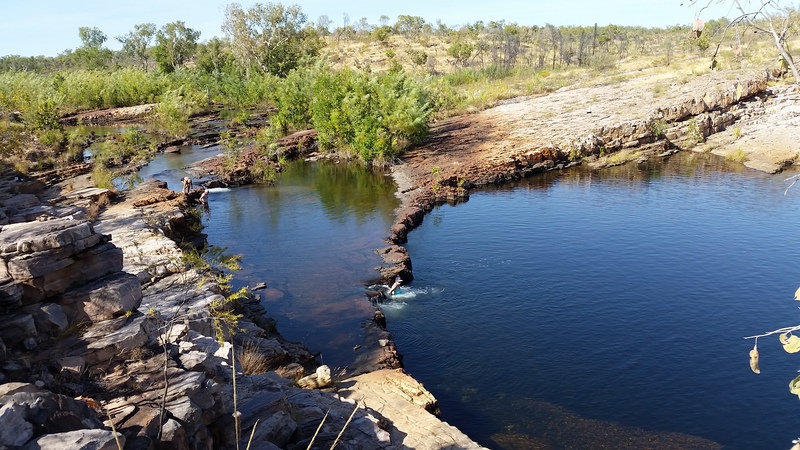 Swimming over to the falls at the lower plunge pool. The next day we got up early and headed out by 8:30 to tackle the 9km return Sweetwater Pool hike. The hike wasn’t too bad, rocky in places, but for the most part gently undulating. Sweetwater Pool at the end was lovely to swim in, not too many people and beautiful scenery to boot. 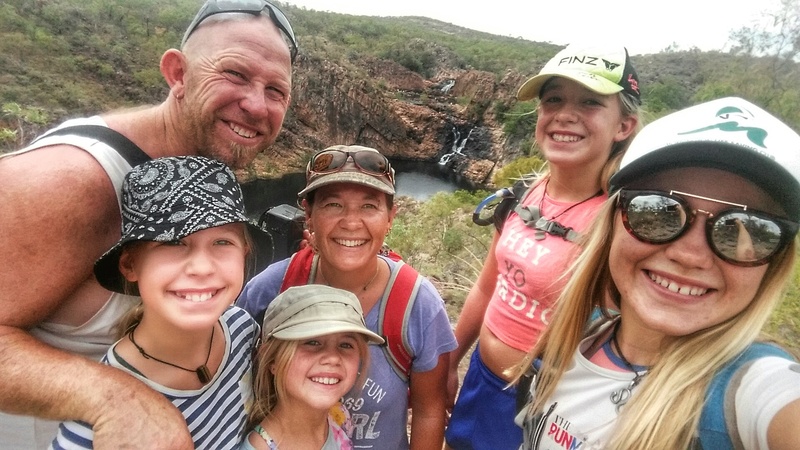 This hike was actually the end of the Jatbula trail that started at Katherine Gorge and took the hikers down into Edith Falls, we even saw quite a few hikers loaded up with their huge and heavy packs. The walk back to camp was a bit more difficult as the sun was directly overhead and was very hot, however we made it back by lunchtime, spending the rest of the afternoon lounging around, swimming in the plunge pool and catching up with Nik’s best mates brother and his family who were on their dream trip across the top of Australia. Tempting Jess into the cool water!!! Playing around riding on the backs of crocs…..
We also met some grumpy, stingy grey nomads, who were quite proud of the fact that they hadn’t paid the park pass for Kakadu and told us we shouldn’t either…..another couple then whinged and complained about having to complete the census whilst we were there….. We could only shake our heads in frustration, as it would be these sorts of people that would be the first to complain when the facilities in Kakadu were downgraded or the roads not graded!! Aside from the minority grumpy travellers, we were also lucky enough to meet twice as many happy and enjoyable grey nomads. 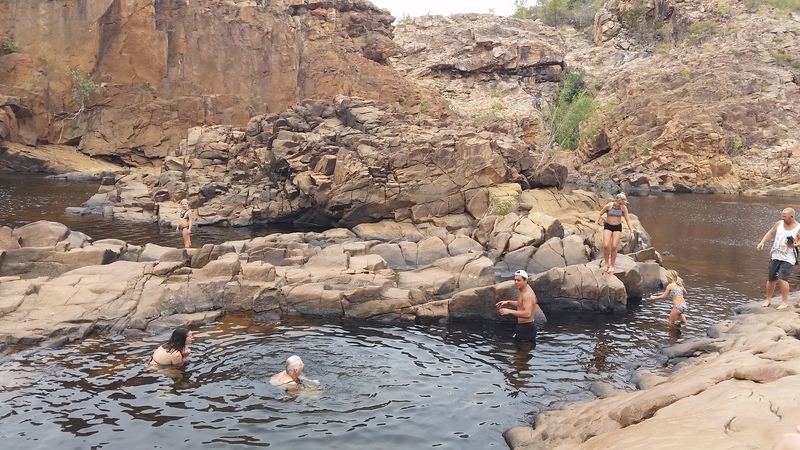 We enjoyed Edith Falls, even though it didn’t have the wow factor for us, I really enjoyed it for the hikes, waterfalls, plunge pools and well set out grassy camping sites complete with central hot showers and flushing toilets and would definitely recommend it. 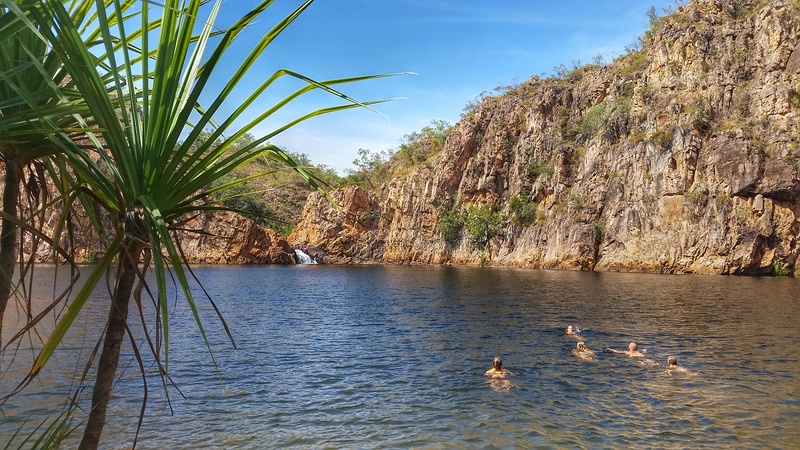 After 2 nights at Edith Falls we headed out, at a much later time than when we arrived and turned northward towards our next adventure and destination on our OZLAP……………….